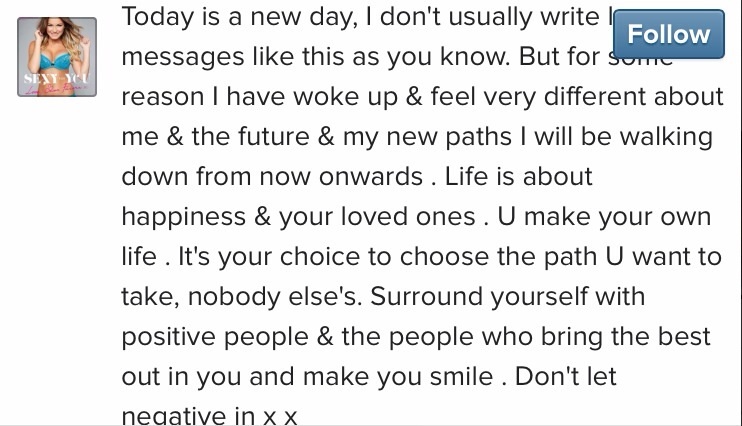 Sam Faiers woke up feeling very philosophical this morning and posted this Instagram message. Apparently Sam has now split (again) from Joey Essex, is he the negative she is talking about? Also Sam was at the same party as Harry Styles this week in LA and rumours have them flirting with each other, although it has been said that the gorgeous Harry was not interested. We will be watching how this story develops. Obviously Sam intends to take her life in a positive direction. This entry was posted in Sam Faiers and tagged cryptic Instagram message, Harry Styles, Sam Faiers on October 29, 2014 by wealthandglamour. This entry was posted in Sam Faiers and tagged Amazing Body, Sam Faiers on October 17, 2014 by wealthandglamour.